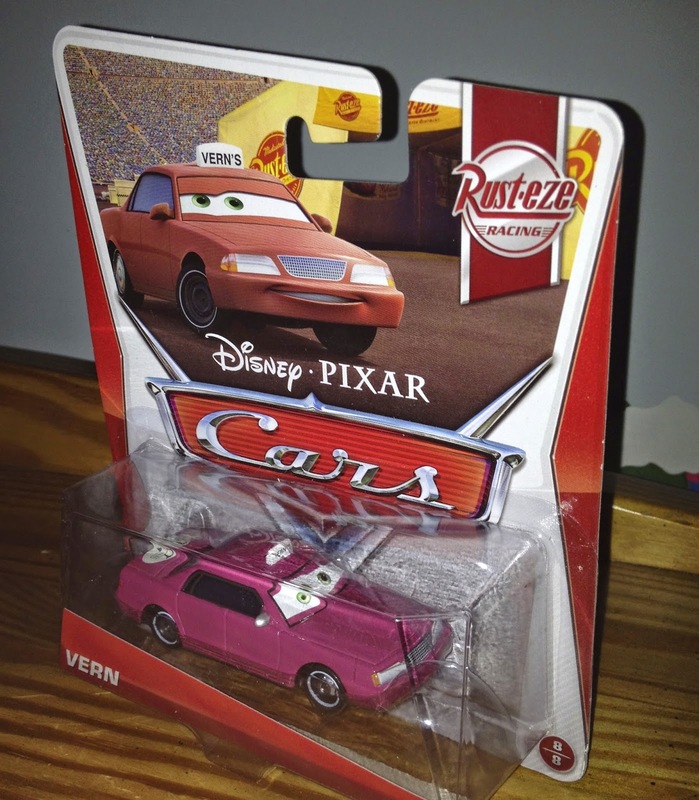 From the original Cars, here we have Mattel's 1:55 scale diecast release of Vern (of Vern's Taxi Service). This particular release was a 2013 re-release of the character and was part of the "Rust-eze" sub-line (even though he has nothing to do with Rust-eze in the actual movie). As seen in the screenshot above, Vern can be seen entering the big Piston Cup race near the end of the film. I have to say, this was another funny choice for a diecast release because, not only is he only seen ever so briefly on film, but you only see him from the back! The character's release as a diecast was the first time his front/face was revealed. "Vern is the owner and sole employee of Vern's Taxi Service in Sonoma. He guides tourists through the beautiful gourmet oil country, and after a day of tasting all Northern California has to offer, he guides them safely back to their quaint G & B's - that's "garage and breakfasts." As mentioned, Vern here is a re-release. He was originally available in Mattel's "Final Lap" series and then the "Lenticular Eyes" series from a few years back.